The USDA food pyramid may be shaped like pizza, but it still calls for 5-7 servings of fruits and vegetables per day. Fortunately, neighborhood farmers markets are almost as plentiful as neighborhood Publix supermarkets. Shop hyper-local using the guide below, featuring several options in Downtown, Miami Beach, and Coconut Grove. The Urban Oasis Project takes the cake (or the cucumber) for most Downtown Miami farmers markets. The organization — which strives to make healthy, local food available for everyone — has three outposts downtown. Monday blues? Meet Monday greens. 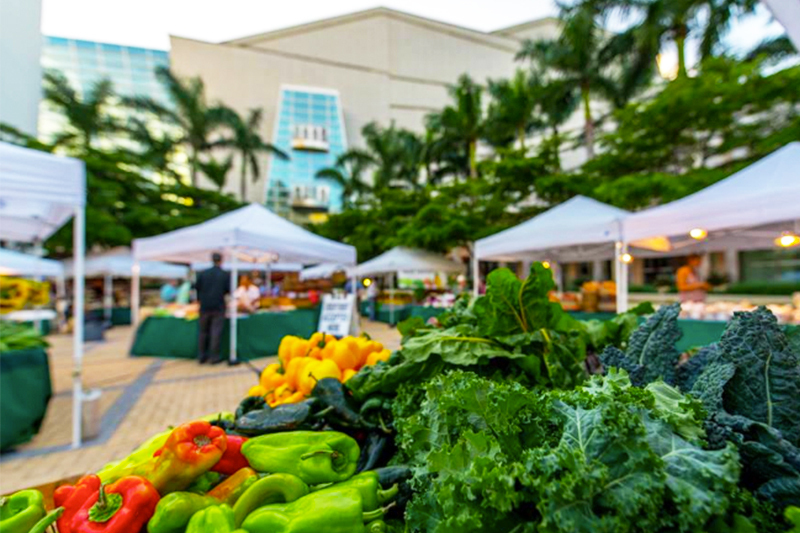 You can visit the Adrienne Arsht Center Farmers Marketplace by Urban Oasis Project at the Arsht Center (Biscayne Boulevard at NE 13th Street) without even rushing during your lunch break — it’s open from 4-8:30 p.m. every Monday. If you’re not much of a chef, you can still enjoy the local produce: The Arsht Center hosts a farm-to-table dinner at 6:30 p.m. each Monday with a five-course, plant-based menu featuring the very same produce available at the market. The Upper East Side Farmers Market in Legion Park (6601 NE Biscayne Blvd.) is another downtown(ish) option from the Urban Oasis Project that’s also close enough for Midtowners and those who live in the Upper East Side. Hit this market on Saturdays from 9 a.m. to 2 p.m. for fresh produce, juices, and specialty food vendors serving up hummus, empanadas, sauces, and even dog treats. 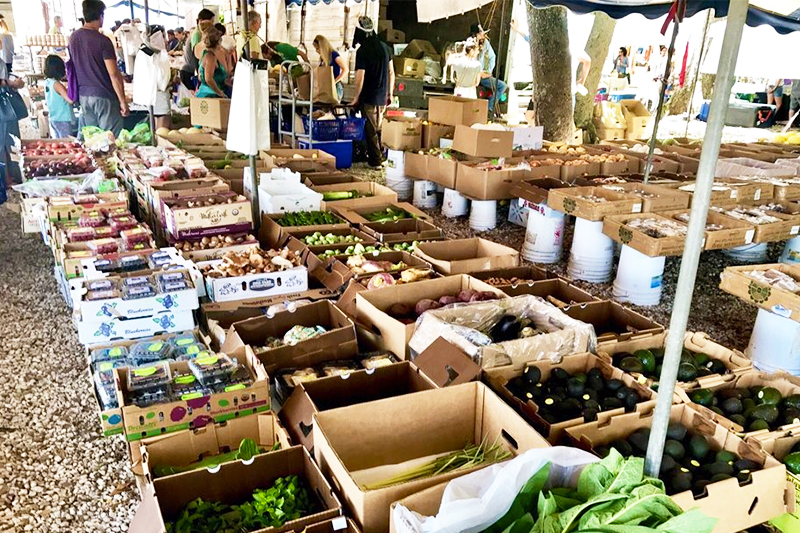 Southwest Miamians can head to the SW Community Farmers Market at Tropical Park (7900 SW 40th St.) from 9 a.m. to 3 p.m. on Saturdays for a similar mix of fresh produce and specialty items. All of the Urban Oasis Project markets accept Florida Access Bucks, a special program that doubles SNAP (food stamp) benefits when used to by fresh fruits and vegetables up to $40 each week, ensuring each and every family — no matter its socioeconomic standing — can enjoy the bounty of South Florida’s harvest. The Urban Oasis Project doesn’t have a downtown monopoly, though. Check out the Green Market Co-Op’s market at Brickell City Centre (701 S. Miami Ave.) on Saturdays from 10 a.m. to 3 p.m.
Get all your shopping done on Lincoln Road — grocery shopping included in Miami Beach. 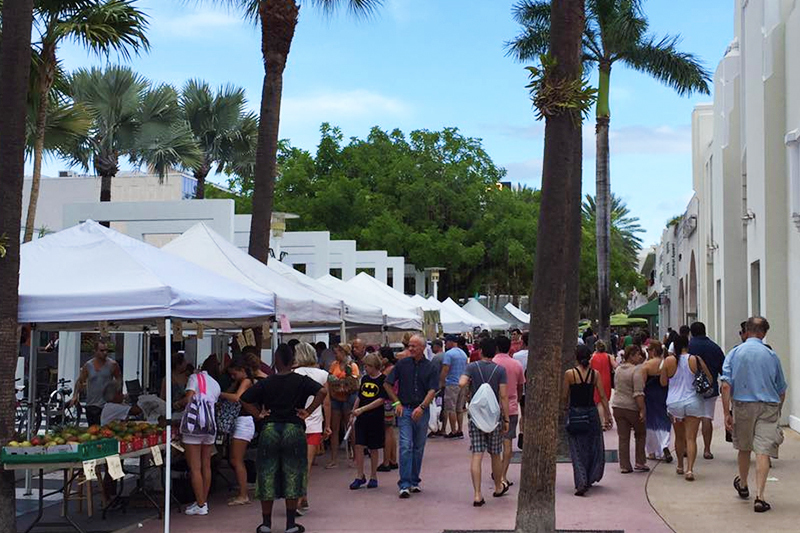 In addition to a range of retail, you’ll also find the weekly Lincoln Road Farmers Market (611 Lincoln Road) on Sunday. Get there when it opens at 9 a.m. for a quiet walk and time to browse a mix of local produce, fresh bread, jams, jellies, local honey, and more before crowds gather. And if Saturday night means you’re having a late start, don’t worry — the market is open until 6:30 p.m. every Sunday all year. Normandy Village Farmers Market (7802 Rue Vendome) is another option in the area. Yelpers knock it for its smaller size and the occasional bad-apple vendor (produce pun! ), but as long as you know it’s not a huge market with infinite options, you’ll find it’s an enjoyable way to spend your Saturdays between 9 a.m. and 4 p.m. This neighborhood’s namesake Coconut Grove Farmers Market (3300 Grand Ave.) features healthy goodies (produce and raw, vegan food — including ice cream) from Miami’s Glaser Organic Farms. This market also earns points for its longer hours. Get your hands on fresh, local goods anytime between 10 a.m. and 7 p.m. on Saturdays.